Left to right: MSgt Rocky Leonard – Queen Anne flag; Major Ray Goff – Betsy Ross flag; CMSgt Van Richmond – speaker and representing “Old Glory”; MSgt Jack Baker – Old Glory flag; SMSgt Bill Nagey – Stary Spangled Banner flag; SSG Tom Allen – Grand Union flag; SMSgt Don Rigsby – Introduction of each flag. 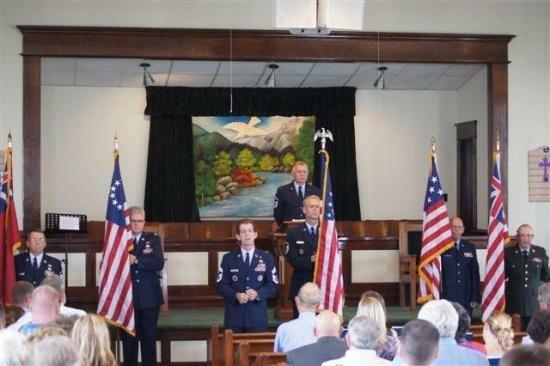 September 11, 2011 was celebrated at Prosperity Baptist Church in Auburntown by presenting the past and present flags of our country. CMSgt Van Richmond also “spoke” for Old Glory telling of the many wars she has come through and the many presidents she has flown for. The first flag presented was the Queen Anne flag carried by MSgt Rocky Leonard. On April 17, 1707, Queen Anne issued a proclamation which spoke of the use of the Union Flag "at Sea and Land." From this time on, the Union Flag began to appear on forts and in regimental colors. This was the flag in use at the time of the Revolution, and can correctly be referred to as the Loyalist Flag. Presenting the Grand Union flag was Prosperity Baptist Church member SSgt Tom Allen, a veteran of WW2. This flag was first raised at sea on December 3, 1775 by John Paul Jones; and on land on January 1, 1776, on Prospect Hill (then called Mount Pisgah) in Somerville, MA, when the Continental Army was mustered into formal existence. It received its name from a reference as the "Grand Union Flag" in one of George Washington's letters. Curiously, this flag was never officially sanctioned by the Continental Congress. Flying aboard a patriot ship, it received the first foreign salute to an American flag from Governor De Graaff of St. Eustatius Island on November 16, 1776. The Betsy Ross flag was presented by Major Ray Goff. One warm day in May 1776 the Congressional Committee (made up of three well known gentlemen General George Washington, Colonel George Ross and Robert Morris) visited Betsy Ross’s home with an unusual request—sew a new flag for what was hoped would become a new nation. She finished the flag either in late May or early June 1776. In July, the Declaration of Independence was read aloud for the first time at Independence Hall. Amid celebration, bells throughout the city tolled, heralding the birth of a new nation. On June 14, 1777, the Continental Congress, seeking to promote national pride and unity, adopted the national flag. "Resolved: that the flag of the United States be thirteen stripes, alternate red and white; that the union be thirteen stars, white in a blue field, representing a new constellation." SMSgt Bill Nagey presented the Star Spangled Banner flag which was made by Mary Pickersgill in July-August 1813. It was commissioned by Major George Armistead, commander of Fort McHenry. It had fifteen stars and fifteen stripes. This was the flag that was raised over Fort McHenry on the morning of September 14, 1814, to signal American victory over the British in the Battle of Baltimore; the sight inspired Francis Scott Key to write “The Star-Spangled Banner”. Standing in honor of the last flag presented, the congregation watched as Old Glory was carried by MSgt Jack Baker. This is the official U.S. flag used during the bombing of Pearl Harbor. The 48 Star U.S. flag was flown from the battleships in the harbor. This famous name was coined by Captain William Driver, a shipmaster of Salem, Massachusetts, in 1831. As he was leaving on one of his many voyages aboard the brig “Charles Doggett” - and this one would climax with the rescue of the mutineers of the “Bounty” - some friends presented him with a beautiful flag of twenty four stars. As the banner opened to the ocean breeze for the first time, he exclaimed "Old Glory!" Captain Driver's grave is located in the old Nashville City Cemetery, and is one of three places authorized by act of Congress where the Flag of the United States may be flown 24 hours a day. The above information regarding the flags was researched from the Internet. Following this moving presentation, a large crowd stayed for a “potluck” fellowship lunch.